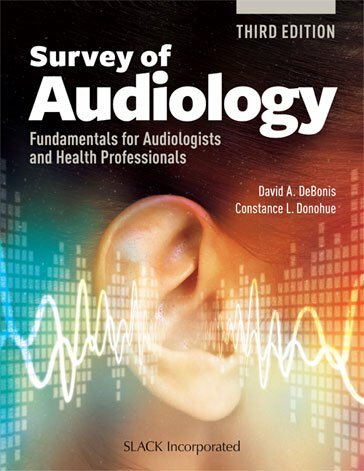 For nearly 20 years, Survey of Audiology: Fundamentals for Audiologists and Health Professionals has provided both the breadth of an introductory survey of audiology and the depth of a detailed textbook. Inside, Drs. David DeBonis and Constance Donohue have combined their years of work in clinical settings and their experience teaching audiology into a textbook intended to give students all the knowledge they’ll need in the most accessible and comprehensible format. In this Third Edition, updates have been made to include the latest information on the most current topics in audiology, including cognition and hearing loss, pharmacology, central auditory processing disorders, wireless technology, hearing aid accessibility, tinnitus, genetics and biotechnology, and noise exposure. With its extensive glossary, numerous case examples, chapter abstracts, learning objectives, and questions for discussion, Survey of Audiology is designed to support learning and reinforce key points in every way. The text also works to integrate the humanistic aspects of audiology with the scientific ones into holistic discussions of assessment and intervention. Through this approach, students will learn to always remember that there is a person behind each set of symptoms. Instructors in educational settings can visit www.efacultylounge.com for additional material to be used for teaching in the classroom, such as PowerPoints and an instructor’s manual which includes test questions, sample course syllabi, and suggestions for classroom activities. While aspiring audiologists will appreciate the depth of Survey of Audiology: Fundamentals for Audiologists and Health Professionals, Third Edition, students of speech-language pathology and other health professions looking for a crash course in audiology will benefit from its readability and wide scope.